St. Georgians, from left: Ron Garner, Aleeda Crawley, your humble scribe, the Web Goddess, the Rev. Chris Carroll, David Gorman, Bill Jaglowski, Bruce Lyons, Kevin Clark, Tony Bousanti. Chris West took the picture. 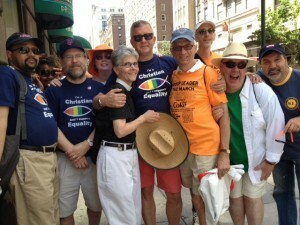 The Web Goddess and I were part of a contingent from St. George’s Episcopal Church in the Gay Pride March in Manhattan Sunday. It was our second march — some of the same people participated in 2007. I was struck, in a very positive way, by the pervasiveness of corporate sponsorship. Coca-Cola was the “Presenting Sponsor,” and all of the T-shirts for the parade marshals and other volunteers said “Diet Coke” on the front. (Mischievous thought: is Diet Coke more gay than “regular Coke”?) Other sponsors included Macy’s, Delta Airlines, AT&T, Citigroup, Target and New York Life. There were less staid sponsors and participants as well, of course, but the buy-in from the titans of commerce testifies to the inevitability of equal rights. Lots of NYC police marching in uniform — not just the Gay Officers Action League, but a dozens-strong police marching band as well. The cop on duty at our intersection was bantering with the crowd. The March has gotten huge, creating a prosperity problem for participants in the staging areas. We had been told to expect to step off around 12:15, but it was about 3:30 when we finally left 38th Street and set foot on Fifth Avenue. We could have had brunch. Several of the St. Georgians wore the T-shirt the Web Goddess designed five years ago — a Rainbow Jesus Fish with the legend “I’m a Christian, and I support Equality”. As we waited to march, three passers-by asked permission to take a picture of me and the shirt. There were just 11 of us from St. George’s, but we packed a lot of diversity into a small group: gay and straight, black and white, male and female, clergy and laity, Democrats and Republican. The huge LGBT for Obama contingent was passing out signs and big round stickers, which I tore off as quickly as my gleeful friends could slap them on me. (The comeback that didn’t occur to me in time: “No thanks, I go the other way.”) The Log Cabin Republicans were represented by about four guys with brave smiles. It pains me that my party is on the wrong side of this issue, but the resistance is only going to weaken over time. This is the civil rights struggle of our era, and the road leads in only one direction.